Bruce Aidells thinks big—which explains how he founded a sausage empire, and why he is obsessed with roasting large cuts of meat in his incredible new Sonoma kitchen. When he sold his eponymous sausage company five years ago, Bruce Aidells began drawing up plans for his dream house: 3,500 square feet in Sonoma, inspired by the work of Greene & Greene, the renowned 20th-century American Arts and Crafts architects. Aidells’s interest in custom-woodwork-heavy design is echoed in his new indoor and outdoor kitchens, which have intricately detailed fir cabinetry and gorgeous, naturalistic rock work. The new kitchens are where Aidells cooks his favorite big cuts of meat—like roasted leg of lamb and glazed bone-in ham—and experiments with artisanally cured meats he develops for clients, including purebred Duroc bacon for Iowa-based Vande Rose Farms, and country ham for the famous pastrami-maker David’s Old World. Aidells’s architectural predilections conform to his Luddite approach to cooking. His latest obsession is roasting over a wood fire, both in his indoor hearth and outdoor pizza oven. 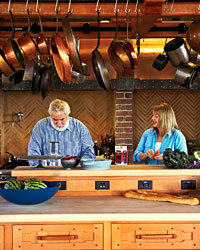 When cooking in his hearth, he often uses a spit or a Tuscan grill set over burning logs. His outdoor pizza oven, encased in custom Greene & Greene-style rock work, is from Mugnaini Imports, the same company that made the oven for Los Angeles’s Pizzeria Mozza. Indoors, Aidells also has a Montague commercial range and an oven from Fisher & Paykel; outdoors, there’s a Viking gas grill with an infrared rotisserie. "You could say I have a lot of fire power," he says. Being able to cook for a crowd and work comfortably with his wife, Nancy Oakes, the chef and owner of San Francisco’s Boulevard restaurant, also drove the design of Aidells’s indoor kitchen. He set up what he calls "the business side" of the island like a restaurant cooking line, with the range, oven and hearth arranged in a row. This leaves him plenty of room for his latest experiments, such as meaty brisket braised with sherry, tomatoes and olives, and an eight-pound rack of pork stuffed with spicy sausage and kale. For his glazed ham, Aidells relies on an all-American ingredient to create a super-crackly crust and sweet sauce: Dr Pepper. But even with his new projects, Aidells hasn’t totally given up on sausage, which has turned the image of his bearded face on the packaging into a national icon. In a separate guesthouse, he built a minimalist kitchen with stainless steel and butcher-block surfaces for sausage-making. Eventually, he wants to invite chefs and the local hunters who bring him wild boar and turkeys to stay and cure their own salami together. His vision of retirement? "I see myself as the guy in the rocking chair outside, giving the chefs and hunters recipes," he says.